Skin cancer is serious business – 2,000 people a year die from skin cancer in Australia! The good news is that skin cancer is almost totally preventable if you protect yourself when you are outside when the UV Index is 3 or higher. What is your individual responsibility? Slip on sun protective clothing – cover as much of your skin as possible. Choose long pants and long sleeved collared shirts. Slop on SPF30 or higher sunscreen – last line of defence for parts of the body which cannot be covered any other way. Remember to reapply at least every 2 hours. Slap on a broad-brimmed hat, not a cap – brim attachments are available for hard hats or helmets. Seek shade – reduce your exposure to the sun with shade whenever possible, especially during breaks. Slide on some sunglasses – close fitting, wrap-around styles are best. Download the free SunSmart app to receive automatic notifications when the UV Index reaches 3 or above in your area and the required sun protection times for each day. Find out more about the UV Index. Sun protective clothing and other protective items such as sunscreen and sunglasses which are bought to be used at work are tax deductable. Visit the ATO website for more information. For more information about how you can protect yourself from overexposure to UV radiation have a read of Cancer Council’s Skin cancer and outdoor work: a guide for working safely in the sun brochure. Are you responsible for others? 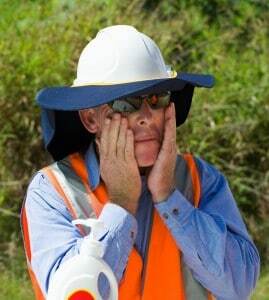 Employers, site supervisors or principal contractors/builders have a duty of care to protect subcontractors or employees on their building and construction site from overexposure to UV radiation. Use a combined approach including guidelines and policy, worker education and use of Personal Protective Equipment (PPE) and clothing. In this way, the risk of skin cancer on building and construction sites can be substantially reduced. For more general information about why and how you can protect yourself and your workers from overexposure to UV radiation have a read of Cancer Council’s ‘Skin cancer and outdoor work – a guide for employers’.